Over February break next week, the Southborough Library is hosting another “Crafternoon” by popular crafter Mandy Roberge. This time, the focus is on “Simple Sewing”. The free craft series is geared to tweens and teens. 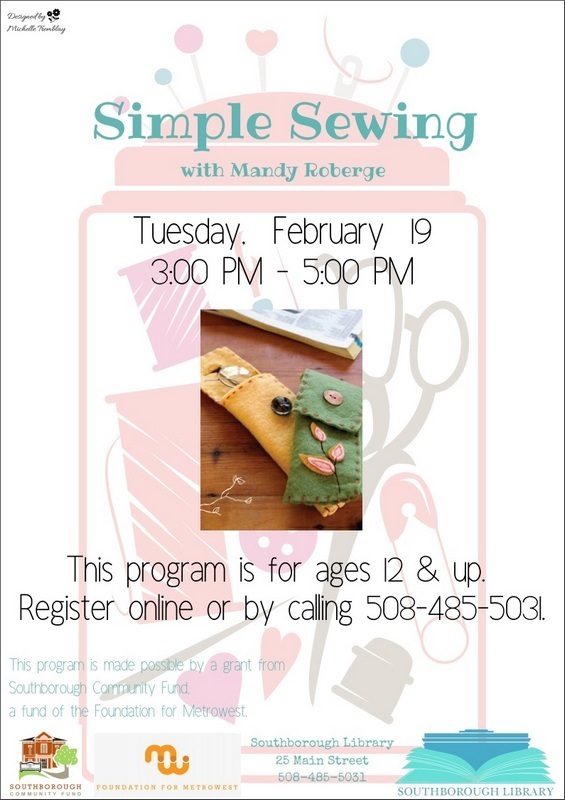 The sewing session will take place on Tuesday, February 19, from 3:00 – 5:00 PM. WHAT CAN YOU DO WITH A NEEDLE & THREAD? Join us for our next Teen & Tween Crafternoon where you’ll create a felt holder for your most treasured items! This program is for participants ages 12 & up! With space limited to 15 participants, registration for is required. Click here to signup online. Or stop by the Front Desk or call 508-485-5031.